Due to a trip to California with my husband, and my children being spoiled by their grandma back in Virginia, we paused the war for 2 weeks. Although I was very cautious during my trip of daily waste and processed food intake, the boys went a little crazy. They consumed Doritos, marshmallows, school lunches etc. Because this is such an infrequent occurrence, I tried not to become overwhelmed by their eating habits that week. I am just grateful that my mom spent a week with my boys and took great care of them while I was gone. Now that I am home, it's a different story. We spent the day today making granola bars, bread, dinner for most of the week, pumpkin muffins and chocolate chip cookies. Although it is time consuming, I do enjoy cooking with my sons and spending quality time with them in the kitchen. 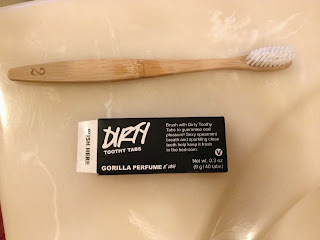 The picture above is of the 100% compostable toothbrush and plastic free toothpaste we use. The toothbrush works great. It is made of bamboo and when we are finished we can throw it in our compost pile. The toothpaste took a little time to get used to. At first, it tasted a bit salty and it was strange to chew a tablet. Now if I use regular toothpaste it is too strong and burns my mouth. There are no toxic ingredients in the tooth tabs compared to regular toothpaste. I am glad there are companies such as Lush that care about our health and the environment. Where do you purchase your toothpaste and brushes? I like the idea of composting the brush. I'm currently using a natural toothpaste, but my mouth doesn't feel very fresh. I actually prefer baking soda, but I've read it might be too harsh to use everyday. I bought the toothbrush on Amazon. They have several different types that are compostable. The tooth tabs I bought at Lush, along with all my other bath products. Lush has a few varieties but I like Dirty the best. It took a few brushes to get used to but it does leave your mouth feeling fresh and clean. I think baking soda would be better than all of the toxic chemicals in regular toothpaste. It was too strong for our house so I found Dirty to be a close and safe alternative.